So, I keep a list of my game ideas as they pop up, like you do, and make sure to go back and comb through the list every now and then. Sometimes they are very much centered around mechanics, but sometimes they are very vague thoughts or phrases that I wanted to hang on to in case they would make a good game. If anyone wants to make those into a game, please feel free. I have more ideas on that list than I’ll ever be able to create in a lifetime. Just let me know what you come up with because I’ll be super curious! And now the games post as promised. Keep in mind, this isn’t “Games I thought were the best out of all games of 2013,” because I did not play all the games. I thought Antichamber was brilliant, but I only spectated that one. And these aren’t necessarily the artsiest-fartsiest of games, or the games with the best design. Rather, this is more of a list of “Games that consumed me in 2013,” or games that was antsy to get off work and get home so I could play some more. Here they are in order played. This game ended up being exactly what I hoped it would be. It had that whimsical, wondrous JRPG-from-my-childhood feel that I have been missing for so long, and I was startled to realize that a lot of that feeling merely comes from the presence of a world map. It was beautiful, and a world that I wanted to spend time in. I didn’t really get into the monster-collecting aspect of it, and stuck with a core group and strategy for the better part of the game, led by MonGod, the tankiest of tanks. I loved the combat in this game, which was active while still retaining something of that menu-based combat feel that I loved in JRPGs of old. If not for Nick’s fatigue of coaching boss battles, I would have plowed through all the post-end-of-game quests. I will do any quest that is framed as helping someone out, so the frequent-buyer style stamp cards were incredibly compelling for me. I wanted to help ALL THE PEOPLE. 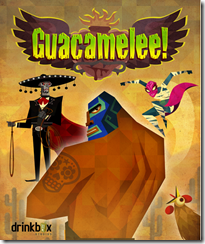 I had seen this game at Indiecade the year prior, and it won me over instantly with its aesthetic and the fact that you can transform from luchador to chicken. 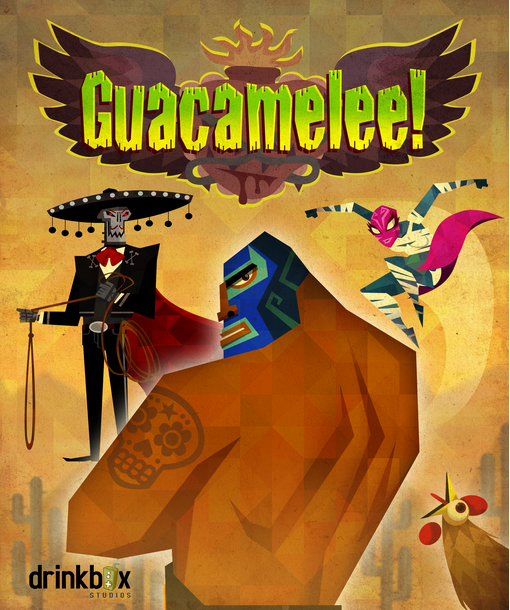 This is a fantastic metroid-vania style brawler, and the art and animation is delightful. The theming was spot on and the music did that weird mariachi-electronica mashup that just worked so well for the game. It had some ups and downs in co-op: the brawling was a great 2-player experience, but the exploring and platforming aspects felt better in single player. I loved how many elegant design solutions showed up, especially for combining get-to-new-places abilities with specific combat needs (the different colored shields). Also you can transform into a chicken. The only bummer in this game for me was the tired old damsel-in-distress trope. I kept waiting for them to throw a clever twist on it, but they never did 🙁 Alas, can’t have everything. It had been a long, long time since I bought a console specifically for a single game, but the indirect peer pressure of friends posting about their villages was too much, and before long the 3DS and Animal Crossing were mine all mine. I really liked how they toned down the guilt-tripping in this game compared to previous iterations. This made me much more excited to return to my village after a small absence, rather than being terrified of the berating I would receive at the hands of my villagers. I’ve never been much for decorating house, but I do love to help run errands for my villagers, and I did manage to find all the fossils. The Halloween event was super fun, and I still feel guilty about caving and becoming another exploitive beetle farmer. I think this game consumed me so well because it fit right into my daily routine. After work every day I would take Mr. Davis for a walk for an hour, and it was the perfect time frame for checking in, digging up my fossils, watering my plants, and taking care of day-to-day town maintenance. Surprisingly, even though it was seeing other people post about this game that compelled me to buy it, I never visited a single other person’s village. Oh, man. This game, you guys, this game. I feel like I’ve gushed enough about how much I love this game already, so I’ll just do a short recap. I loved how simple the actual mechanic was, and how complex they were able to make it without needing much more input. 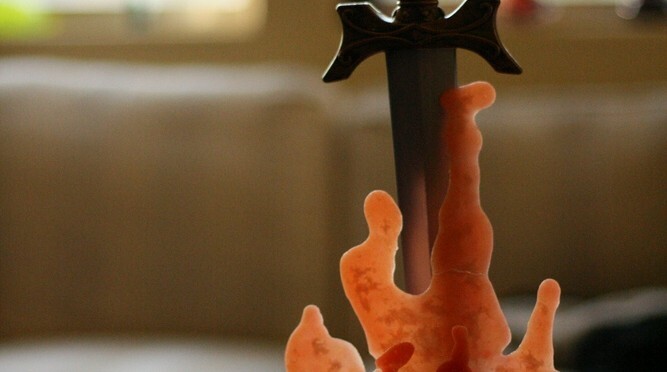 It made it incredibly accessible while still having the potential for a lot of depth. 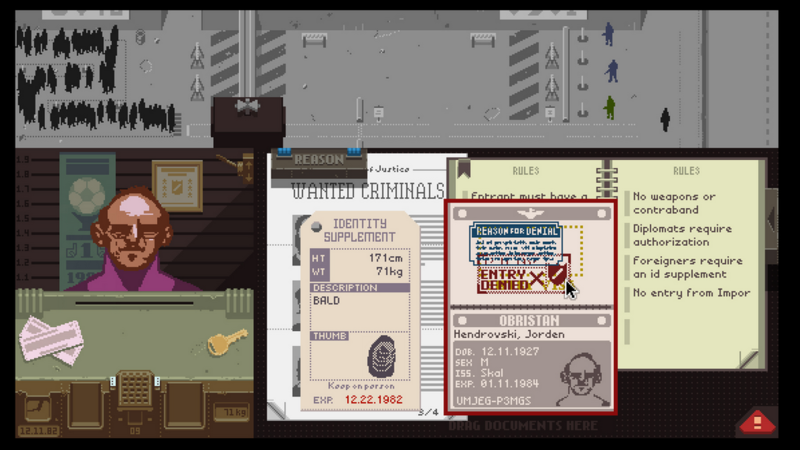 I loved how many ethical dilemmas I faced playing this game, and how they just showed up without any face-rubbing or drama, but were simple but still stirring. I love how intensely I cared about the wellbeing of my family, who were nothing more than names on a screen (and perhaps that is why they became so important to me, because my imagination filled in all the meat). This was also an incredibly intense, at times stressful co-op experience. I’m actually not sure if I could have handled the later levels alone. If you have yet to play this game, please give it a try. For me. 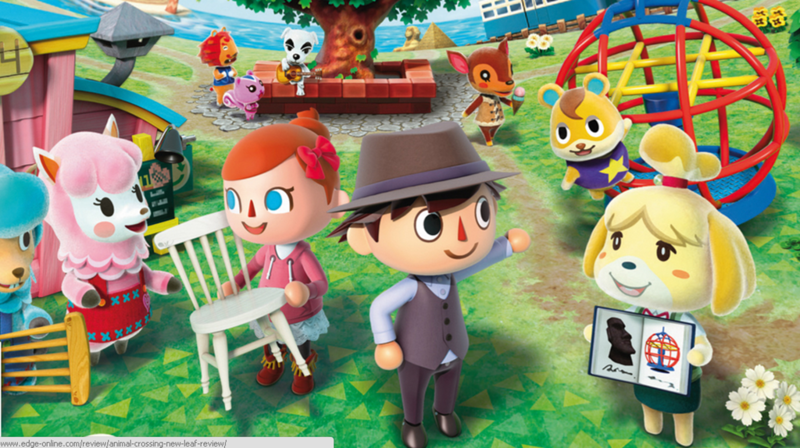 Buying a 3DS for Animal Crossing suddenly made me realize that I got to be excited about the release of this game! A Link to the Past is tied for my all-time favorite Zelda, and I have fond memories of how much of an impression that game had on my life, so I was very excited about the idea that this game would take place in the same world. 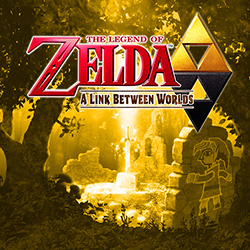 A Link Between Worlds was like coming home, the perfect balance of nostalgia factor and fresh new content and mechanics. It also made really good use of the 3D feature, with all of its clever puzzles that had to do with verticality in the top-down world. The pacing was delightful, and even when I perceived solutions to puzzles very quickly, the discovery was still intoxicating. I did a lot of the completionist stuff purely because I wanted to spend as much time as possible in the world, and was depressed to have finished it. This year was full of many adventures and exciting times. I feel kind of like it was a ramp-up, and that 2014 might explode…but for good or for awesome? Only time will tell. Here’s a few memories from 2013. At work, we finally revealed the project that I’d been working on since Resistance 3 shipped, that being Sunset Overdrive. It felt great to be able to share the trailer with the world, and I worked on many things for the first half of the year, both exciting and challenging. However, during the summer, I made a transition to working on something else that was more of a process experiment. I will be able to talk about that in more detail, soon, but the second half of 2013 was incredibly refreshing and fulfilling, work-wise. I continue to be ever grateful for Insomniac and my job as a game designer. Meanwhile, I’ve turned up the networking knob a bit for 2013, partially under the encouragement of Nick, and have been more active in reaching out and connecting with my fellow game devs, through the internet or Game Dev Drinkups or whathaveyou. Mr. Davis has had some ups and downs this year. He had to have some teeth pulled at the very beginning of the year, and then had a frightening bout with pancreatitis which has unfortunately turned into a chronic condition. However, in his normal day-to-day life he remains happy, and continues to be a valued source of unconditional love in my life. Nick and I moved in together this year! So far it has been wonderful, and Mr. Davis is also happy about the arrangement. Meanwhile, I feel like I’ve had a lot of insights this year, and forged deeper bonds with friends and mentors. Whenever I review it in my mind I feel an overflowing of love and gratitude, and I’d like to take part of 2014 to express these feelings in a more overt way. Financially, I continue to plug away at the student loan, and if all goes as planned, it should be gone by the end of 2014! Hobby-wise, playing League of Legends and watching e-sports has only been on the rise. As far as games played, I’ll save my top 5 games of 2013 for another post. I got involved in more out-of-work projects this year, including a few game jams and my first solo Ludum Dare. I also buckled down and participated in National Novel Writing Month, which is something I’d always meant to do but put off. Not only was I successful, but I opened some manner of portal in my brain and a giant story is trying to squeeze its way out. I have been honestly surprised at how consuming the experience has been. 2014 will see it out into the world. In other side projects, I made an effort to work more non-fiction into my reading rotation, and feel like I’ve absorbed all kinds of interesting new bits of knowledge as a result. Mentoring continues to be a part of my time, both through Game Mentor Online and through connecting directly with students via my various alma maters, as is photography at the animal shelter. This year I felt like I was more successful than ever with consistently riding my bike to work. Nick and I also established a frequent hiking habit which has been beneficial. And ever since moving into the new apartment, I have been walking a lot more on a regular basis. I feel really good about myself right now, but have an antsy urge to get harder/better/faster/stronger, just because. I think it is a desire to channel the blossoming of energy that I’ve felt grow inside of me this year, possibly as a result of all the side projects. I have a sensation that 2014 is going to be full of creative energy and positive relationships, and I am excited and curious and wiggling with anticipation for whatever surprises it may have in store for me.